With extra-large cooking cavities and rapid preheating times on our built in single ovens, you can now get the whole family’s meal to the table in less time than ever before. There are multiple cooking functions to choose from allowing you to select the exact temperature, time and heating style to produce the best possible results every time. We have created a selection of black, white and steel designs to complement every style of kitchen and included detailing like wooden Zen handles or hideaway control knobs to add that extra special touch to your home. 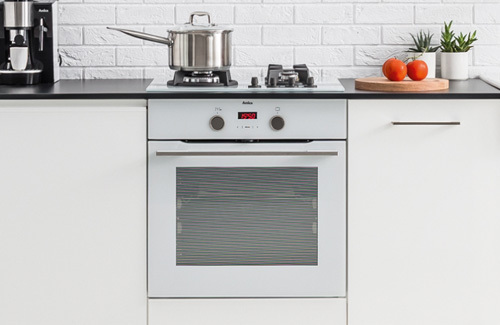 Controlling your cooking is simple too with a choice of rotary control knobs or modern touch screen technology available across the collection. Whatever your cooking style, there is guaranteed to be a single oven partner to suit you. Starting at 10 cooking functions and going all the way up to 34, this range caters for every type of cook. Now with a choice of self-cleaning options like the Aqualytic and Pyrolytic cleaning programmes you can even get rid of oven cleaning as a chore in the home and look forward to reliable, maintenance-free cooking at every mealtime. Sometimes in life the capacity of a single oven doesn’t quite cut the mustard. So when entertaining guests or the family feast at Christmas, take a look at a double oven for that extra pair of hands in the kitchen! 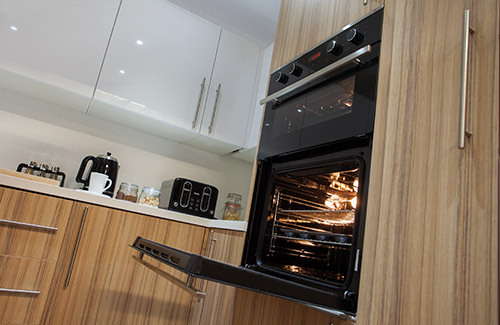 Our double ovens can be under counter or in a tall housing unit letting you decide how you want your kitchen to look. SO whether you are baking the perfect birthday cake or setting up all the festive trimmings, take a look at Amica’s double oven range.